It's that time of year again and while I know that many of you have been crafting for Christmas for weeks (or even months now), I just cannot get into the holiday mood until Thanksgiving dinner is done! There is something about sitting by the light of the fireplace, tree aglow and a few random Santas to keep me company, as I sing along with Doris Day, that puts me in the crafting mood. I love how the product enhances my home, but the process is half the fun and around here making the projects during the season is tradition! I already have my ideas and supplies ready to go and I will be sure to share what I create over the next few weeks with you, but to get you started, I have put my favorites from last year together here. Rest assured, in true Exquisitely Unremarkable style, they can all be whipped up rather quickly, they won't break the bank and you really don't need any crafting experience to end up with fabulous looking results. 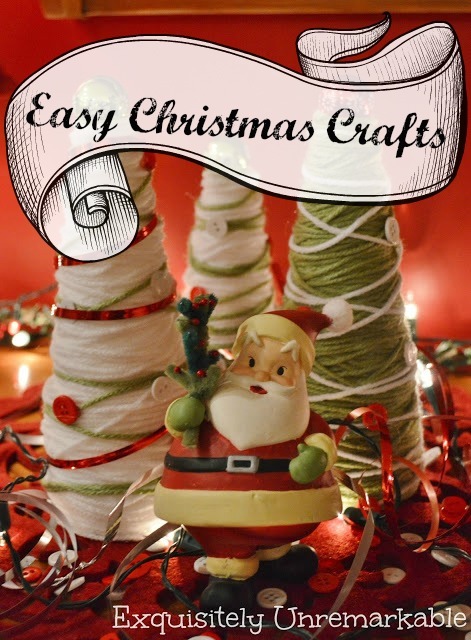 These super easy tabletop yarn Christmas trees are hands down my most popular holiday craft. They are easy to do with a few dollar store items! I love to recycle old puzzle pieces ~ here's a few festive ways to use them this season! Are you a big fan of wooden signs, but hate the lettering? I have a trick to make you look like a pro! Dollar store treat bags make a great advent calendar and decorative garland all at once...and did I mention they were only a dollar? Are wreaths your thing instead? 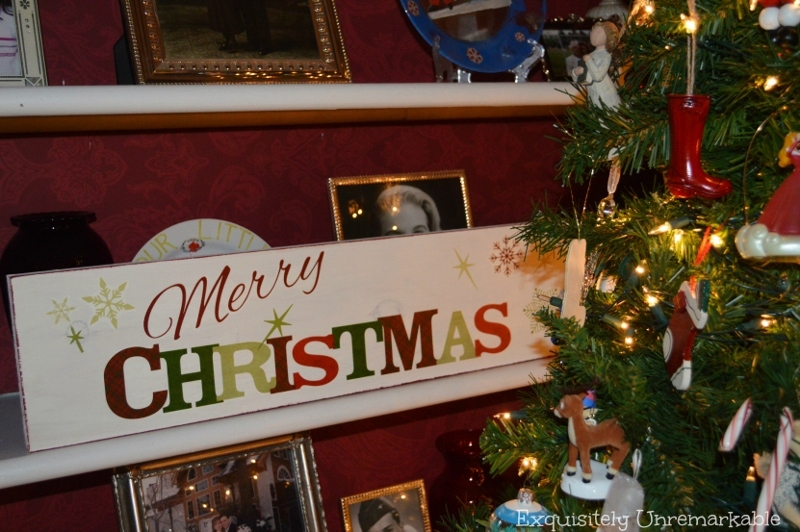 Triple the impact on your front door in mere minutes with faux or real evergreens! Are you a Frozen fan? 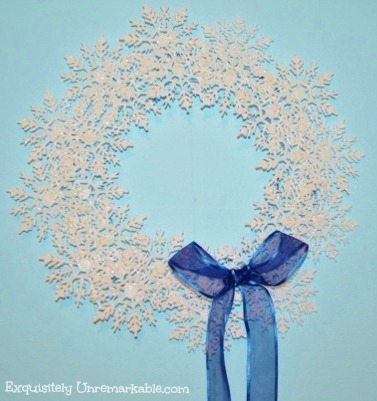 This dollar store snowflake wreath will bring out your inner Elsa. 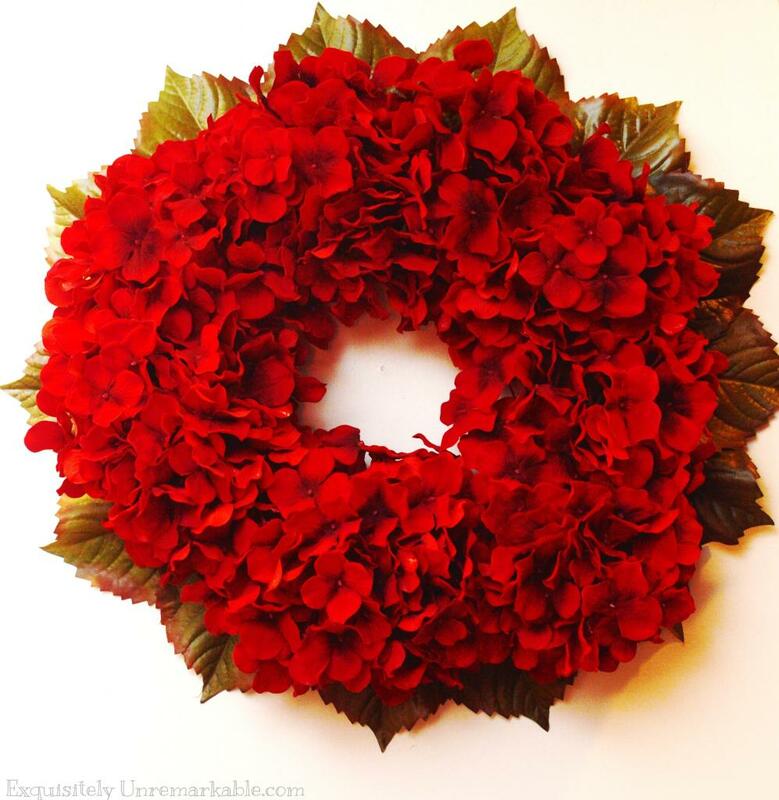 While I didn't make this hydrangea wreath with Christmas in mind, it sure does look festive this time of year! I usually add a few white lights to make it sparkle! Keep your eyes peeled for a brand new batch of Christmas crafts coming soon and in the meantime, Happy Holidays to you! Are you a December Christmas crafter? I had a feeling you were creating something Christmas-y for us! All these crafts are adorable. 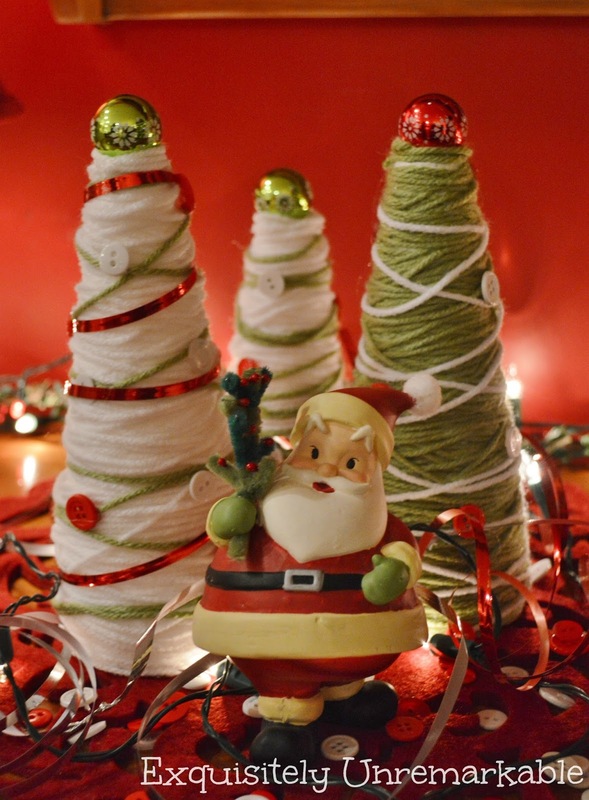 I especially love the yarn Christmas trees - they're cute as a button! For me, making Christmas crafts, with a fire going, carols playing, and snowflakes covering the windows, is such a cozy scene. Thanks for sharing and hope you are having a wonderful Thanksgiving weekend! Thank you Poppy! I hope you are enjoying a lovely weekend as well! It's the official Christmas kick off weekend here in the states and we are happy to comply! ;) We actually even had a few flurried yesterday! Just enough to add mood, not mess!! These are some adorable Christmas crafts, Kim! I still want to do one of those jigsaw puzzle crafts -- you have done so many cute ones! I adore some of the things at the $Store. I've been purchasing those snowflakes for a couple of years now, using them in so many different ways. I look forward to more of your crafty ideas! Oh, I am a Christmas crafter, thanks to my parents! And I am in agreement with you that things can't get started UNTIL AFTER Thanksgiving dinner and was it ever good. I just had some leftovers! Kim, it's great to see you! It seems as if you were gone for a few days, and you were missed. I too am loving being home from school for Thanksgiving, playing with a project I will be sharing on Friday. Hello Anita! Thank you so much for the sweet comment. I am glad you had a delicious turkey day! We were stuffed (and have since be re-stuffed!) with yummy food, too! I was missing! There was a very exciting event that happened in my home, to my children, and we were completely consumed by it. They won a singing contest and we have since been swamped by some very wonderful attention! I haven't had a minute to read blogs, write posts or craft in two weeks! We're getting back to normal around here now, even put our tree up today! Thanks for checking in and I can't wait to read about your own pretty project! 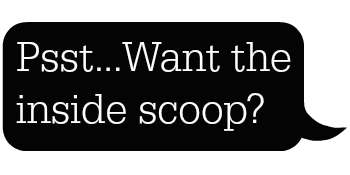 I love catching up with your blog. Congratulations on your talented children. About the crafty stuff -- how do you stick pine cones onto a styrofoam cone? I am trying to make a glitter pine-cone/glitter ribbon one. I am all thumbs! Thank you for popping by Teri! I like that garland, too. It was a whimsical addition last year! Have a lovely weekend! Pinecones in to styrofoam, huh? Well, I don't know if this is the proper way, but I would get floral wire and wrap a piece around the base of the cone, like at the last row. Then I would poke the wire into the styrofoam. You would probably have to make the wire piece rather short so it's not floppy and if you are using many pinecones, covering the entire cone, I may be tempted to go back with my glue gun to secure them to one another a bit. I hope that makes sense and now I can't wait to see the finished product!! :) Thanks for the kiddo congrats! Kim, great ideas, I like the puzzle piece wreath. Thank you Anita! <3 It's been fun and we are an artsy family for sure!! Hi Kim...I am your newest follower and found you through Nancy ! 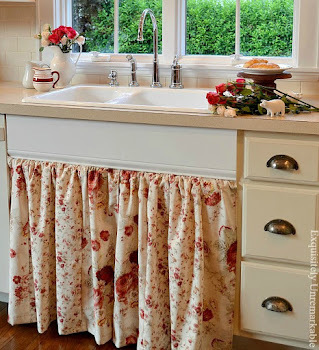 I love small cottage inspired decorating, country accents, and anything that makes a house feel like a home,,,regardless of its size. We raised our boys in a small 1950s bungalow and when we went to sell it, were surprised how many younger couples just thought it was too small! but,,,it did sell and we are now in a little bit larger home and are empty nesters!! I would take a DIY remodel over a new build any day though. Love all your crafty Christmas ideas and wish you a warm and wonderful day. Fresh snow on the ground here in Alberta today! Wow, Kim. You've kicked me into high gear about Christmas! I like all of these, but especially the puzzle piece and the snowflake wreaths. I'm gonna look up the sign lettering tips too! You too, Cheryl! I hope it was a good Thanksgiving weekend! :) The sign lettering is a cheat. It's a wall sticker! I love doing crafts! My problem is that I am living with my mom, so I have no where to put all of the crafts that I make. (She doesn't like them around the house.) But sometimes I make them as presents, or to give away on Listia! I would like to try the puzzle piece wreath for sure! The puzzle piece projects are super easy and they make really cute gift tags or ornaments for presents! Either way, you can give them away. I have never heard of Listia...your comment made me Google it! Cool! Yarn Christmas Trees are just darling! I love it all Kim! You know how Christmas Crazee I can be and I love the Advent calendar again and of course your Christmas puzzle craft! You are the queen of simple crafts dear!!! Love, love, love that chair. I'm going to try a Christmas board too. Thanks. Thank you, Barbara! I am so glad that you found some inspiration here!! Love the puzzle piece wreath, the DT wreath made from snowflakes, and the garland made from treat bags - what a wonderful, colorful, inexpensive idea! I must do these! Thanks so much, Barb! I am glad you found something fun. Happy Holidays in July...well, August! !